While February may seem far away, today marked 100 days until the Opening Ceremony of the 2018 Winter Olympics in PyeongChang, South Korea. Forty-two Team USA Olympians and Paralympians, top hopefuls and legends visited Times Square to get the public pumped for the upcoming Olympics and Paralympic Winter Games. 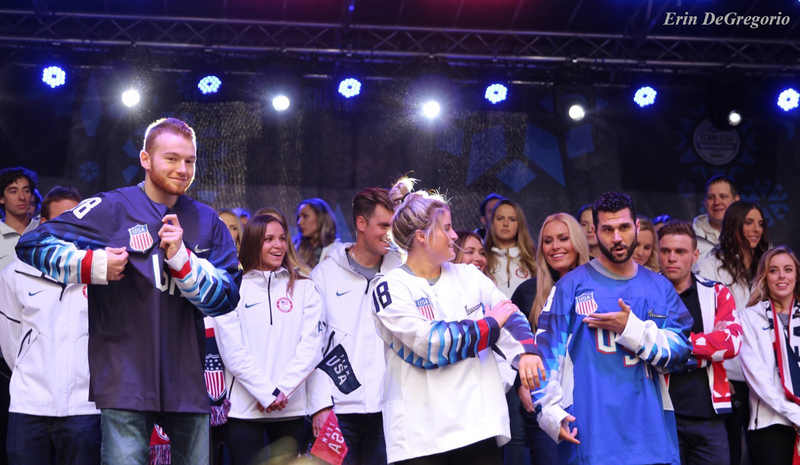 This celebration was the first stop of the traditional Team USA WinterFest tour, which is making 12 stops across the country - and even one in Seoul, South Korea - over the next three months. 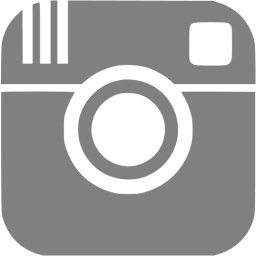 It features meet and greet autograph sessions with the athletes, interactive activities and other opportunities for patriotic-themed selfies. Fans pretended to be Olympians by climbing into a bobsled; learning how to perfect their curling skills with Olympic bronze medalist John Shuster and 2016 World Junior Championships silver medalists Sarah and Taylor Anderson; experiencing the sport of skeleton (where you go head-first down a steep ice track on a tiny sled) through virtual-reality technology in a giant, inflatable snow globe; and mimicking to bite a medal on a podium while wearing a red, puffy Team USA jacket. 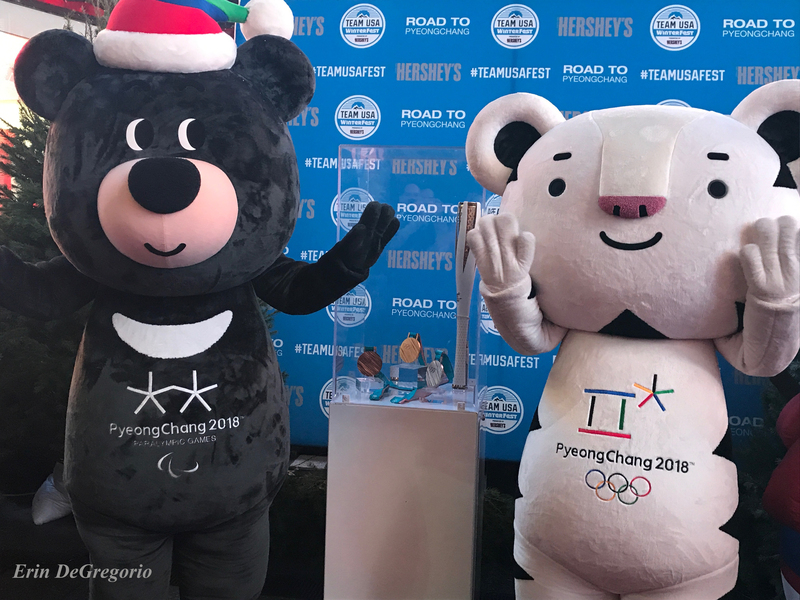 They also were able to visit the Team USA Social Media Truck where they could face-swap with an athlete via Snapchat; create a custom Olympic gif; and write good-luck messages on a digital message board before the athletes leave for PyeongChang. 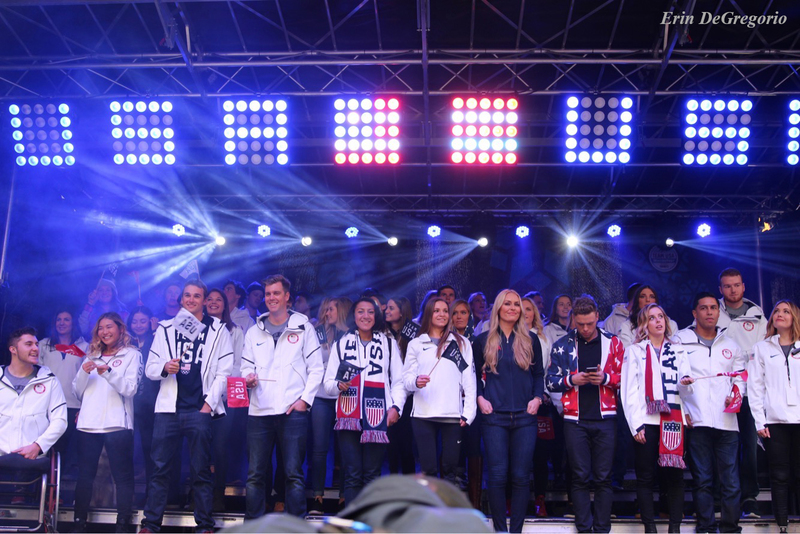 The Team USA spirit in the heart of New York City was infectious. 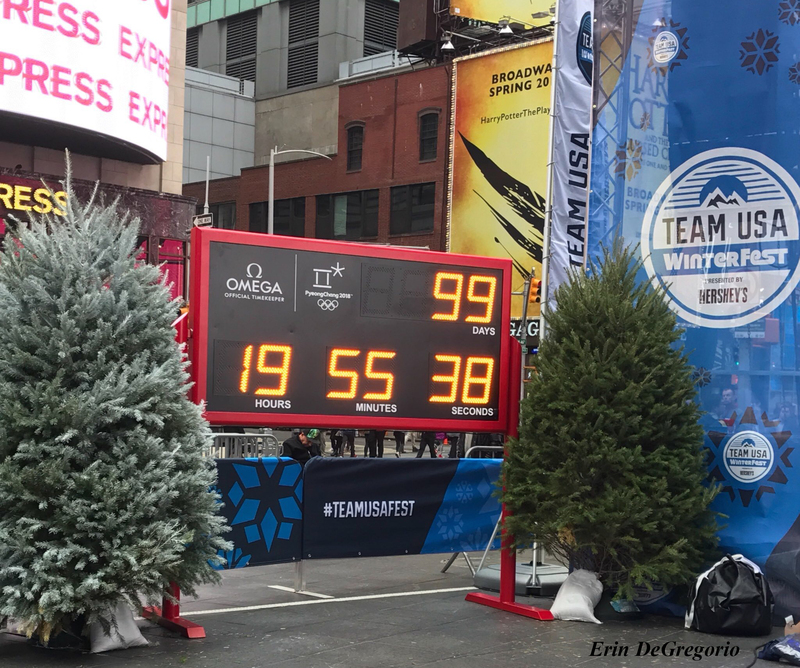 Duffy Square, most notably associated with the iconic, grand red staircase, was transformed into a winter wonderland with artificial snow swirling in the air and real pine trees and wooden, decorative sleds lined up throughout the square. Plus, Dave Fischer, director of communications for USA Hockey, revealed the team ice hockey jerseys that’ll be worn in South Korea - with 2014 silver medalist Brianna Decker modeling the white (home); 2014 Paralympic sled hockey champion Declan Farmer modeling the navy blue (away); 2006 Olympian Brian Gionta modeling the royal blue. Fischer said they are lightweight and breathable, and the silicon emblems will actually sparkle under the arena lights. When asked which jersey was their favorite, a majority of the athletes cheered for the white, which transitions into navy and royal blue on the sleeves and has a red band at the wrist. "Any time you get to represent your country, you put on the red, white and blue - it means a lot. Growing up playing hockey, you always wanted to represent your country and pride with the USA,” Gionta said. “So when you put the jersey on - whether it’s new or old - it doesn’t matter, you get pretty excited about it." To celebrate 100 Days, the athletes wore various versions of Olympic gear and couldn’t contain their excitement as they talked about their previous performances and goals for PyeongChang, should they make it through their respective sports’ qualifying competitions. As many as the athletes were saying, it felt like the Games could be right now, not in February. "It’s crazy to think that we’re already here. This will be my second Games and it all starts right now," said 2014 Paralympic bronze medalist Amy Purdy. "This is where you start to get really excited - you start hearing the Olympic theme song and everything going into the Games. The energy just builds from this point on." Yet at the same time, 2014 Paralympic sled hockey champions Declan Farmer and Brody Roybal also expressed their nervousness for participating in next year’s Paralympics. "We don’t want to disappoint everyone who’s put so much time and energy into us, letting us go overseas to represent our country – especially coming off of a loss last year to Canada," Farmer and Roybal said together. "It seemed we had become a little complacent because we had been so successful in the past years. This year everyone’s been training above and beyond." But only two members have been officially announced on the team roster - Lowell Bailey and Susan Dunklee for the biathlon, a combination of cross-country skiing and rifle shooting. Qualifying events for most winter sports and fan favorites like figure skating, snowboarding and skiing haven’t taken place yet since many national and international competitions mainly take place in January. Team USA expects to send about 245 athletes to the Olympics and hopes to be the largest team competing in South Korea. Since 243 athletes are still undetermined, predictions were made as to who could represent America. Thirty-four-year-old snowboarder Kelly Clark is looking to make her fifth Olympic appearance. Snowboarder and fan favorite Shaun White is also aiming to qualify for his fourth Games and get some redemption after finishing fourth in the half-pipe for the 2014 Games. And 33-year old alpine skier Lindsey Vonn, who participated in the Times Square celebration, is hoping to qualify for what she thinks will be her last Olympics and become a four-time Olympian. She’s also looking for redemption as she returns from a knee injury and surgery that kept her off the slopes in Sochi. Though she currently feels healthy for an athlete of her age and has been training hard since the summer, she admitted that she’s rusty. "Last weekend wasn’t the best start," said Vonn who reflected on her first World Cup giant slalom (a combination of alpine skiing and alpine snowboarding) appearance in two years. "But I’ve been waiting eight years for another chance at gold and I’m ready." The next stop on the WinterFest tour will be Omaha, Nebraska, in conjunction with the U.S. Olympic curling team trials on November 11. NBC will cover the PyeongChang Olympics with eight reporters, February 8 through February 25, 2018. According to NBCSports, NBC Universal will air more than 2,400 hours of live primetime coverage across all time zones for the PyeongChang Winter Games. The Paralympics will take place March 9 to March 18, 2018.